Fred Iyak was born on April 1, 1961 in the community of Inuvik in the Northwest Territories. Encouraged by his mother, whose Inuit ancestors came from the Alaskan side of the border at Demarcation Point, and by his father who gave him art tools and supplies as a young boy, Iyak sold his first carving at the age of twelve. He graduated from grade twelve in Inuvik High School and won both the Golden Hammer for his superior accomplishments in industrial arts and the certificate for achieving the highest marks in senior art. His twenty-foot murals still decorate local corridors. Today Iyak is a full time professional sculptor. 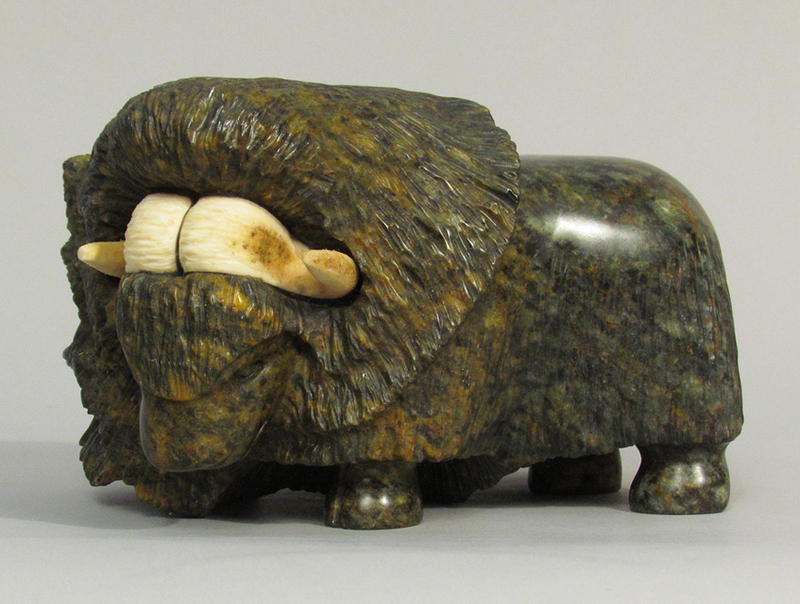 Iyak has a wide range of subject matters; he is interested in wildlife and all aspects of Inuit living which he portrays in a vivid and energetic manner. Iyak is known to work on 5 or 6 sculptures at the same time to keep his interest up; and the artist estimates that he has carved thousands of pieces. Iyak finishes his sculptures with a layer of wax that he bakes in the oven which gives each carving his personal touch. Iyak claims that he will never stop carving but sometimes he changes direction and works on jewelry and visual arts. Iyak believes that the stone dictates the carving. Iyak is an award winning artist whose works sold out at Expo 86 in Vancouver, BC. His pieces are placed in numerous collections in the country and around the world. Iyak’s works have been praised for their excellence by such prestigious collectors as the Devonian Institute, which displays his works with the University of Calgary.